SWOT is the acronym for Strengths, Weaknesses, Opportunities and Threats. It is a strategy analysis tool. It combines the study of the strengths and weaknesses of an organization, a geographical area, a sector, an industry, a product or a project with the study of the opportunities and threats to their environment. SWOT analysis is a useful tool that can help in handling both ordinary and unusual situations by exploring both internal and external factors that may be influencing. It is a structured planning method for strategy formulation. It involves specifying the objective and identifying the internal and external factors that are favourable and unfavourable for achievement of the objectives. SWOT analysis usually starts with defining of a desired end state or objective. Strengths are the attributes that are helpful in achievement of the objective. Weaknesses are the attributes that are harmful in achieving the objective. Opportunities are the external conditions that are helpful in achievement of the objective. Threats are the external conditions which could do damage to the objective. Thus strengths and weaknesses are the internal factors over which there are some measures of control while opportunities and threats are external factors over which there are essentially no controls (Fig 1). SWOT analysis technique is credited to Albert Humphrey, who led a research team at the Stanford Research Institute. SWOT analysis came from this research which was conducted from 1960-1970. The research was funded by the Fortune 500 companies to find out what had gone wrong with corporate planning and to create a new system for managing change. To understand SWOT it is necessary to understand the four factors of SWOT. These are explained below by taking an example of an organization. Strengths – These are the qualities that enable to accomplish the organization’s mission. These are the basis on which continued success can be made and sustained. Strengths can be either tangible or intangible. These are in what the organization is well-versed in or what it has expertise in. It includes the traits and qualities the employees possess (individually and as a team) and the distinct features that give the organization its consistency. Strengths are the beneficial aspects of the organization or the capabilities of an organization and it includes human competencies, process capabilities, financial resources, products and services, customer goodwill and brand loyalty. Examples of organizational strengths are huge financial resources, broad product line, no debt and committed employees etc. Weaknesses – Weaknesses are the qualities that prevent the organization to accomplish its mission and to achieve its full potential. These weaknesses deteriorate influences on the organizational success and growth. Weaknesses are the factors which do not meet the standards which should be met normally. Weaknesses in an organization may be depreciating machinery, insufficient research and development facilities, narrow product range and poor decision making, etc. Weaknesses are controllable. They must be minimized and eliminated. For instance – to overcome obsolete machinery, new machinery can be purchased. Other examples of organizational weaknesses are huge debts, high employee turnover, complex decision making process, narrow product range and large wastage of raw materials etc. Opportunities – Opportunities are presented by the environment within which the organization operates. These arise when an organization can take benefit of conditions in its environment to plan and execute strategies that enable it to become more profitable. Organizations can gain competitive advantage by making use of opportunities. Organization should be careful and recognize the opportunities and grasp them whenever they arise. Selection of the targets that serves the stakeholders while getting the desired results is a difficult task. Opportunities may arise from market, competition, industry/government and technology. Threats – Threats arise when conditions in external environment jeopardize the reliability and profitability of the organization’s business. They compound the vulnerability when they relate to the weaknesses. Threats are uncontrollable. When a threat comes, the stability and survival can be at stake. Examples of threats are – unrest among employees; ever changing technology; increasing competition leading to excess capacity, price wars and reduction in the industry profits etc. 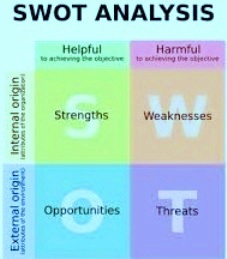 The following are the steps employed in SWOT analysis. The first step is to define the desired state or objective. The purpose of conducting a SWOT may be wide or narrow, general or specific. The selection of the contributors for the SWOT analysis is the next step and is Important since it influences the final outcome. SWOT analysis is the result from consultation and discussion with the contributors and not just from their personal views, however expert. The third step is background preparation which is important for the subsequent analysis to be effective. This preparation is carried out in two stages i) Exploratory, followed by data collection, and ii) Detailed, followed by a focused analysis. The information on strengths and weaknesses is to focus on the internal factors of skills, resources and assets, or lack of them while the information on opportunities and threats is to focus on the external factors over which there is little or no control such as social or economic factors. There is to be flow of information from the contributors. It is important that the information is specific, evaluative and analytical at the stage of compilation and recording of the SWOT lists. Mere description is not enough. The next step is listing of strengths. Strengths can relate to the group, to the environment, to the perceptions, and to the people. After listing of strength listing of weaknesses comes. In this listing it should not constitute an opportunity to focus on the negative but be an honest appraisal of the way things are. Important questions for this listing are; (i) What are the obstacles that may prevent progress? (ii) Which elements need strengthening? and (iii) Are there any real weak links in the chain? The step of opportunities is designed to assess the socio-economic, environmental and demographic factors, among others, to evaluate the benefits they may bring to the SWOT analysis for examples the availability of new technology. The next step is the listing of threats. It is the opposite of opportunities and this may with a shift of emphasis or perception have an adverse impact. Weighing threats against opportunities is not a reason to indulge in pessimism; it is rather a question of considering how possible negative experience may be limited or eliminated. The same factors may emerge as both a threat and an opportunity. Most external factors are in fact challenges, and whether these are perceived as opportunities or threats is often a valuable indicator of morale. The facts and ideas listed above are sorted and grouped in relation to the objectives. It may be necessary for the SWOT analysis to select the five most important items from the list in order to gain a wider view. Clarity of objectives is the key to the process, as evaluation and elimination is necessary to remove the unnecessary items. Although some aspects may require further information, a clear picture should emerge at this stage in response to the objectives. It is to be ensured that the SWOT analysis is used in subsequent planning. It is a source of information for strategic planning. It builds the strength of the organization. It reverses the weaknesses of the organization. It maximizes the response to the opportunities. It helps in overcoming the threats to the organization. It helps in identifying core competencies of the organization. It helps in setting of objectives for strategic planning. It helps in knowing past, present and future so that by using past and current data, future plans can be chalked out.